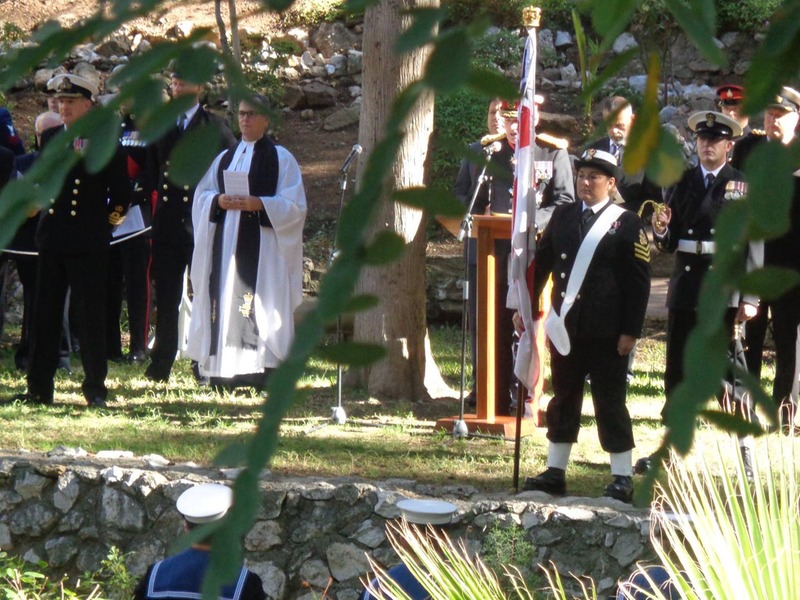 Images and reports on Trafalgar commemorations at various venues…. 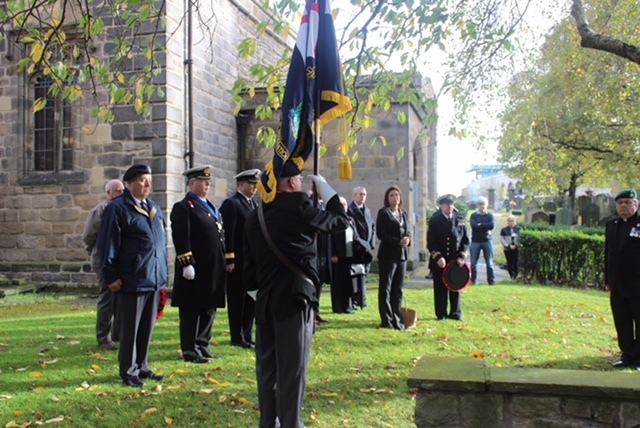 The Society was represented here by Ian Wallace, who accompanied members of the Collingwood family to the annual commemorations. Images courtesy of a much travelled ‘Flags’. 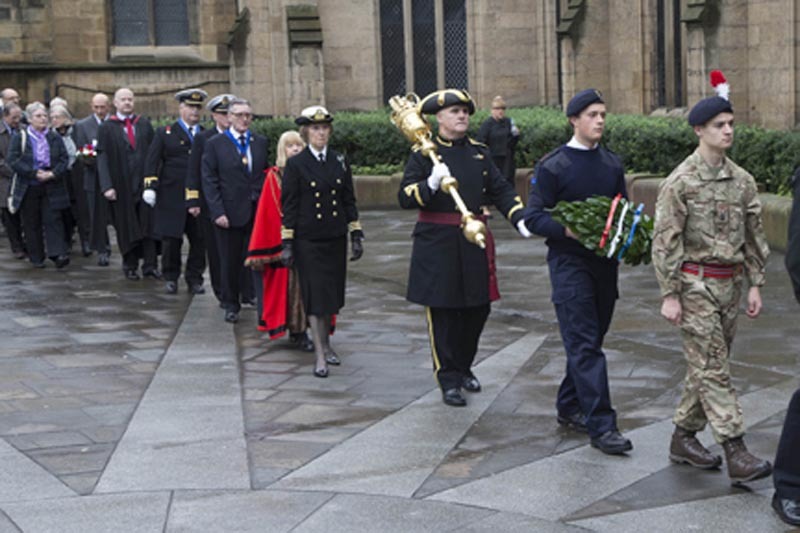 The regular Trafalgar service, with wreath laid by the Lord Mayor, Cllr. Linda Wright. Images courtesy of Steve Brock. 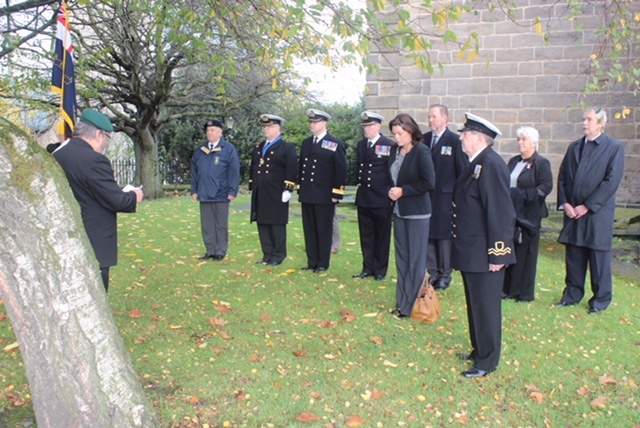 This event particularly remembered John William Trotter, Master of HMS LEVIATHAN at Trafalgar, who is buried in this churchyard. 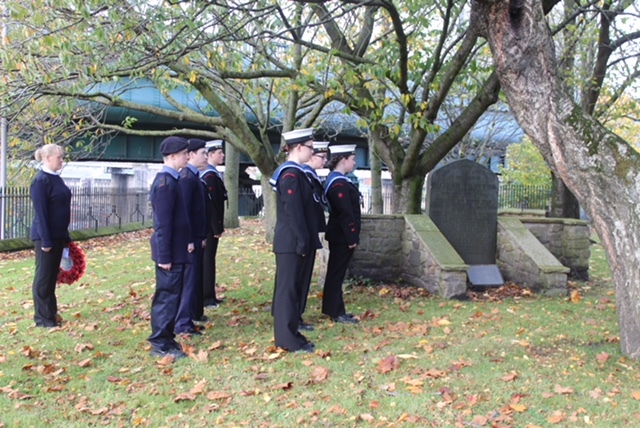 The event was organised by TS FLAMINGO (Gateshead Sea Cadet Unit). 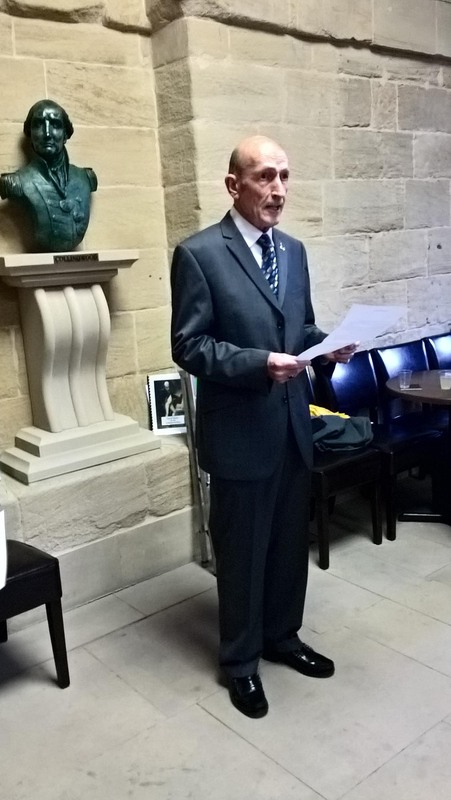 We are gathered here today to rmember the life of JOHN WILLIAM TROTTER, who was born here in Gateshead, on Bottle Bank, in ‘The Goat’ public house, that was run by his parents and which stood just across the rtoad from here. He was christened here in St. Mary’s on 2nd October 1770. In 1785, he was apprenticed for seven years to Captain William Usher, a Newcastle Master Mariner. This is where wJohn would have learned his trade as an excellent mariner. By 1797, he had joined the Royal Navy and was serving as Master of the Royal Navy’s 18-gun, 121 crew sloop HMS SYLPH. The Master was in charge of navigation and the general handling of the vessel. He later went on to serve in the same capacity on two more sloops, HMS HERMES and HMS VENUS. On 12th September 1798, John was made a Freeman of the City of Newcastle. In 1802, John joined the 74-gun HMS MAGNIFICENT as Master – it was a big step up. on 23rd December 1803, he switched again to the 74-gun HMS LEVIATHAN, capained by Henry Bayntun. The crew included 17 Geordies. At Trafalgar on LEVIATHAN, John commanded the manoeuvring of the ship and her sails, as required by the Captain. He would have played a crucial role, being at the con throughout the battle and attending to other actions, such as sending out damage parties, all the time in a very exposed position, likely to be hit by musket fire, cannon balls or grape shot. During the battle, John was able to amnoeuvre HMS LEVIATHAN to attacck the Spanish SAN AUGUSTIN, raking her fore and aft, causing such huge casulaties that she surrendered. 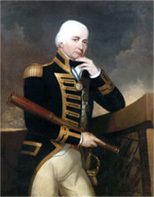 Admiral Collingwood sent the LEVIATHAN back to Britain. In 1816, John was back on Tyneside and ‘swallowed the anchor’. Later in life, he had a son who followed in his father’s footsteps, becoming a Master Mariner. John died on 18th February 1850 and his burial took place here on 22nd February 1850 in the family grave. 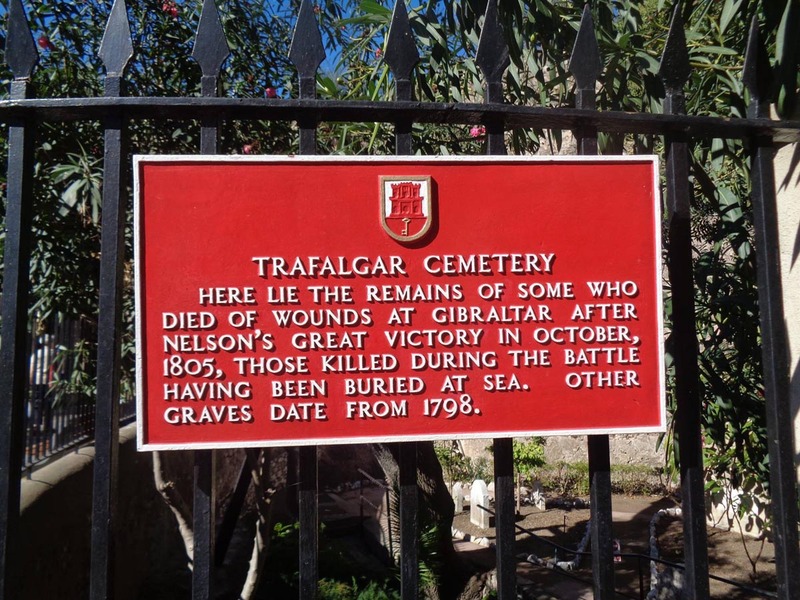 It has been said that he was truly one of Gateshead’s greatest sons and we remember him with pride today on this anniversary of Trafalgar. 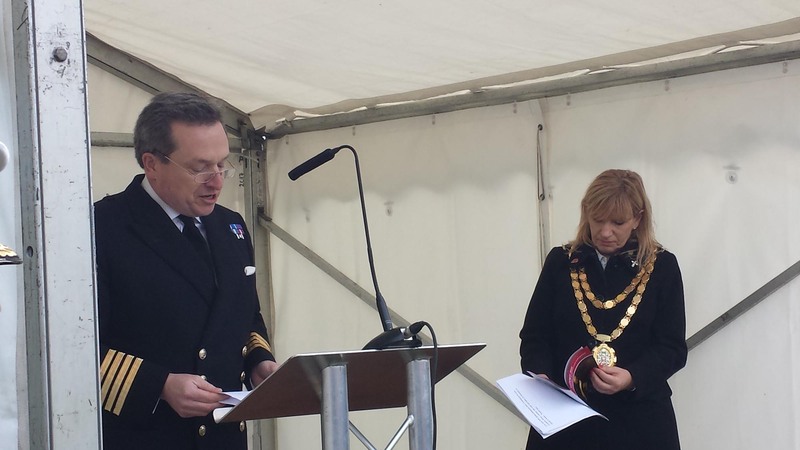 North Tyneside Council’s ‘Toast the Admiral’ event. 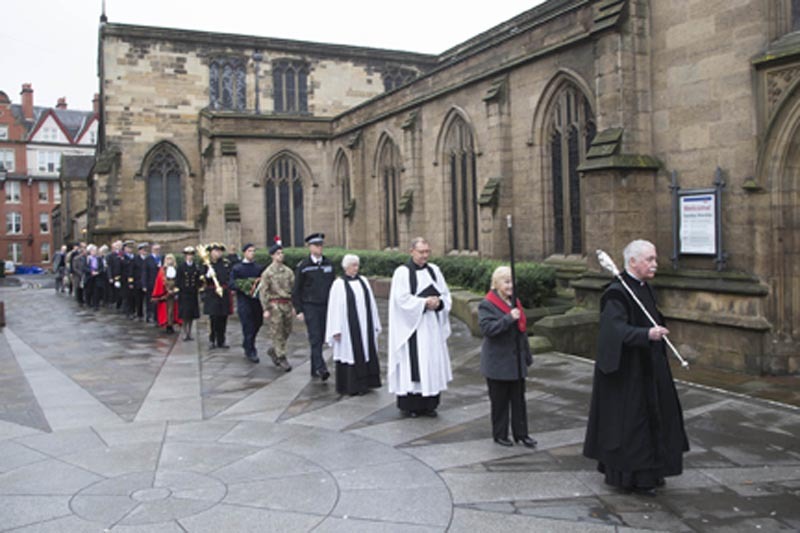 Images courtesy of Chris Bishop. 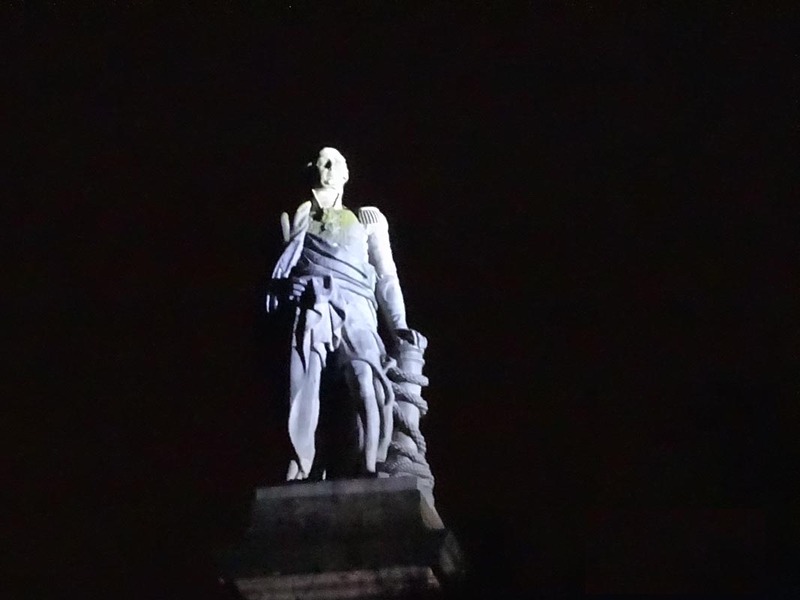 Good morning and thank you once again, for inviting me back to toast one of the nation’s greatest naval heroes, Cuthbert Collingwood, Vice Admiral of the Red, on today, the 212th anniversary of the Battle of Trafalgar. 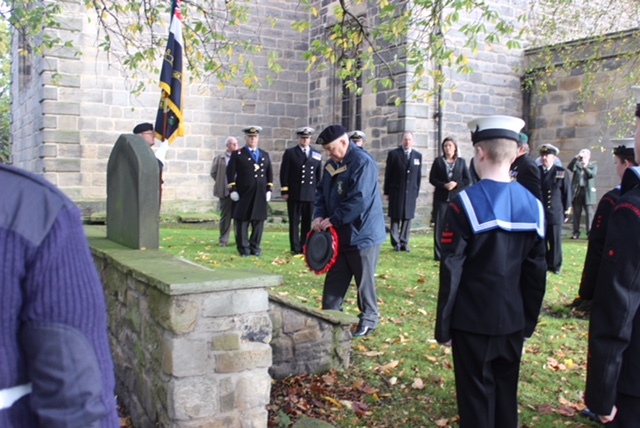 I would like to talk a little today about Collingwood’s sense of duty to his country and the Royal Navy and how when the call came to return to sea again, he answered that call at once, despite already having served with distinction for many years. 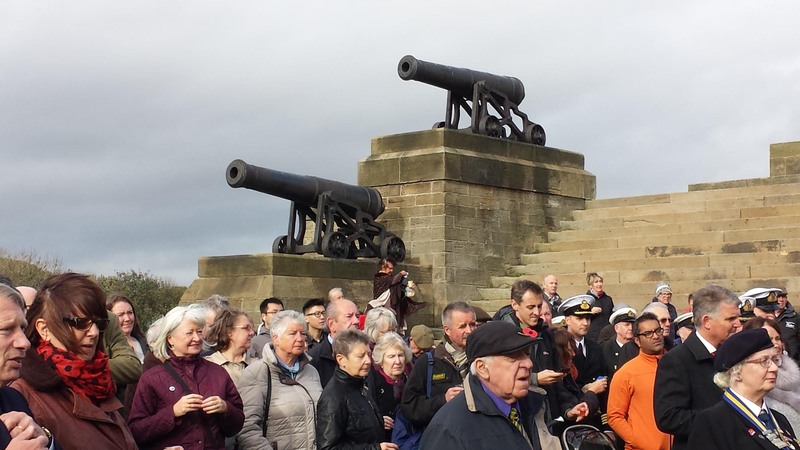 I would also like to explain a little of the early stages of the battle itself, when these mighty cannon you see around the monument roared into action, the first British guns fired in anger on the day itself. 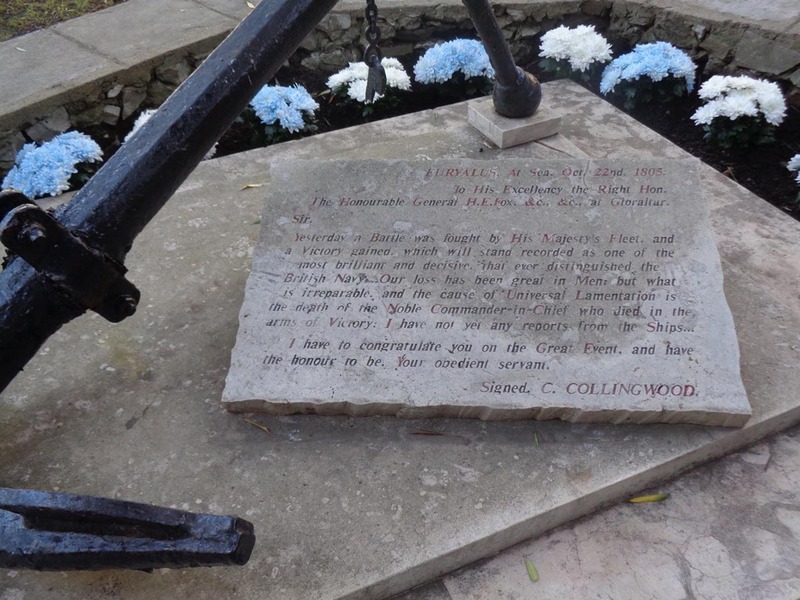 At this stage Collingwood was 52 and life as a fighting naval officer was catching up with him. Cannon fire had had impaired his hearing, he was long sighted and needed glasses for reading and suffered from rheumatism. At 5 feet 10 inches, he was quite tall for his day but had developed a stoop after years at sea bending below the low deckheads of a man of war. He enjoyed a year or so at home where he devoted his time to his family and improving the state their home in Morpeth. Contemporary accounts tell of a man happiest with the simple pleasures of life, such as his garden or educating his young daughters. He is also supposed to have loved to chat and gossip – a trait he shares with many sailors in my experience! However the stormclouds of war were gathering. The Treaty of Amiens had been a false dawn, not the start of a period of protracted peace as Collingwood had hoped. Instead it had bought the French time to re-group. As the French Navy grew again, it became only a matter of time before they once again contested the Royal Navy’s supremacy on the high seas. In March 1803, the Admiralty wrote to Collingwood, asking if he was prepared to return to sea. He replied that he was and packed in readiness. When the call came in May, he left immediately. 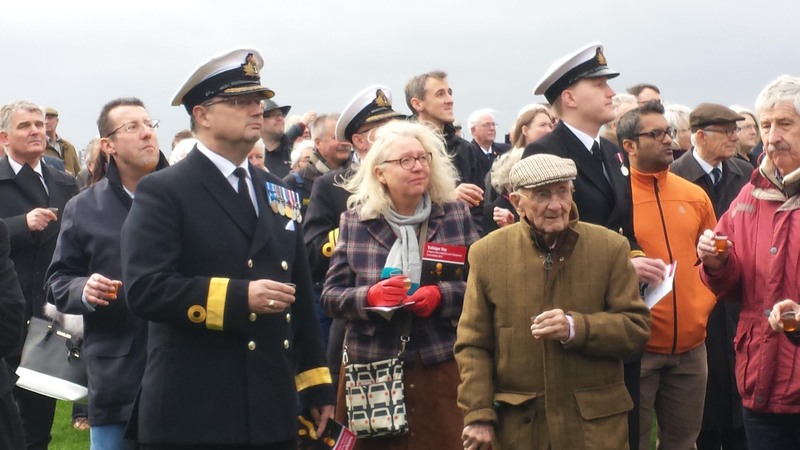 When he bade his family farewell, he could not have known that a further 7 years of sea service lay ahead of him and that he would never see them or his home again. 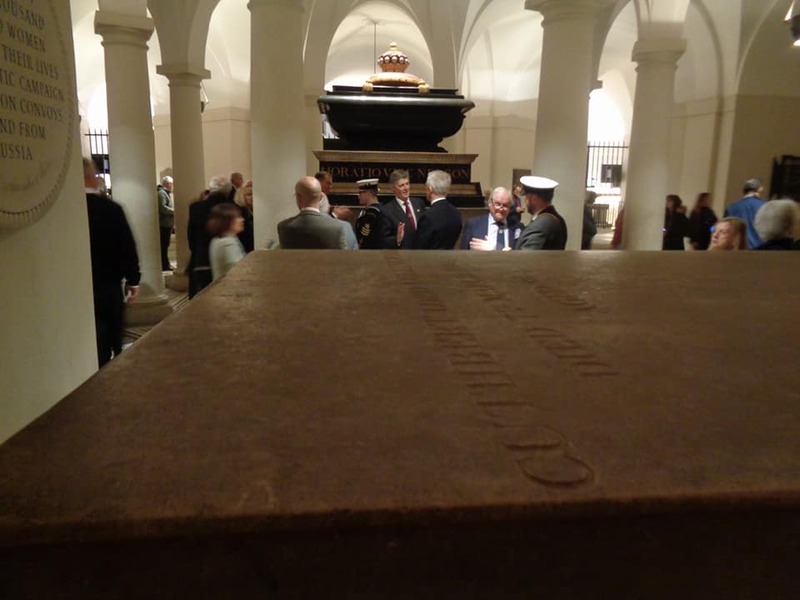 Indeed he would never set foot on English soil again once he had sailed from Portsmouth. 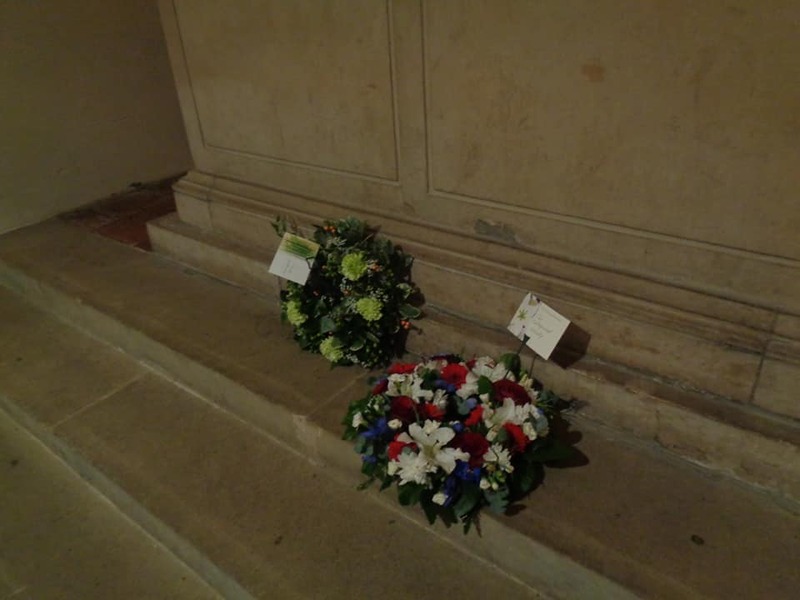 I have emphasised Collingwood’s own sense of duty, but it would be remiss of me not to also draw attention, to the sacrifice of his wife and children, left behind when that call to arms came. Fast forward on to October 21st 1805, and let’s consider the role of these guns in the very opening stages of the battle. The French and Spanish Fleet had sailed from Cadiz the previous day and the British Fleet, deployed in 2 columns closed to engage them. Collingwood is leading his column in his Flagship Royal Sovereign. This ship had been transformed from a slow object of fun, the West Country Waggon as she was unkindly known, by a refit which included a freshly coppered hull. This made her the fastest ship in the Fleet. On the day of the battle, that meant that she was the first to engage the enemy, springing ahead of the other ships in her column. The relative positions of the 2 Fleets meant that for 20 minutes she was subject to broadsides from 6 enemy ships without being able to return fire. 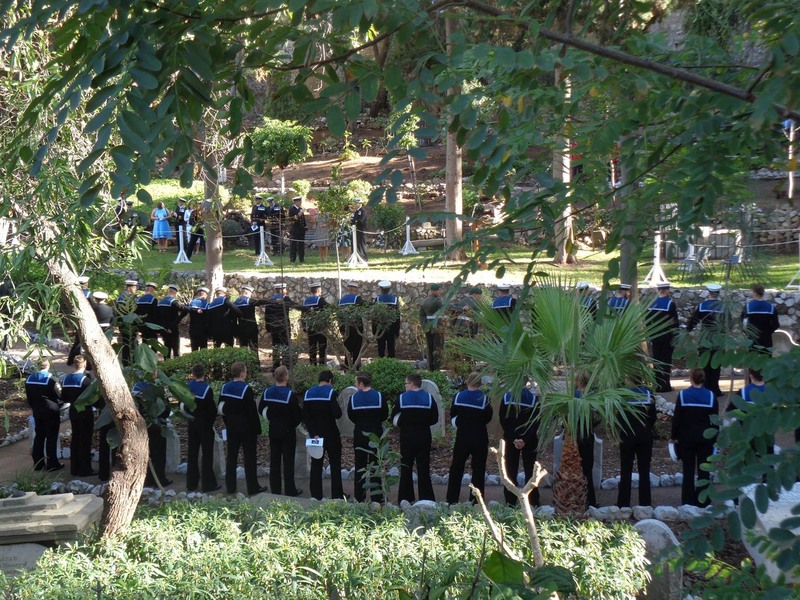 The men lay flat on her deck, guns loaded and ready, but silent. It must have been terrifying, but Collingwood was the model of calmness and an inspiration to his sailors as the ship pressed on into the maelstrom of cannon fire. Finally, as Royal Sovereign crossed the stern of the enemy flagship, Santa Anna, she fired a broadside of cannon like these, double-shotted for good measure. In that instant, over 100 men were killed or wounded and so many of Santa Anna’s guns destroyed or dismounted that her part in the battle was over. However, being so far ahead of any support, Collingwood now had to deal alone with a number of enemy ships who closed his position. Pretty soon, his ship was dis-masted and engaged in a point blank slugging match, with cannon balls from the opposing ships even seen colliding in mid -air. It was a brutal action but Collingwood and Royal Sovereign’s mighty cannon, with their superior rate of fire prevailed. 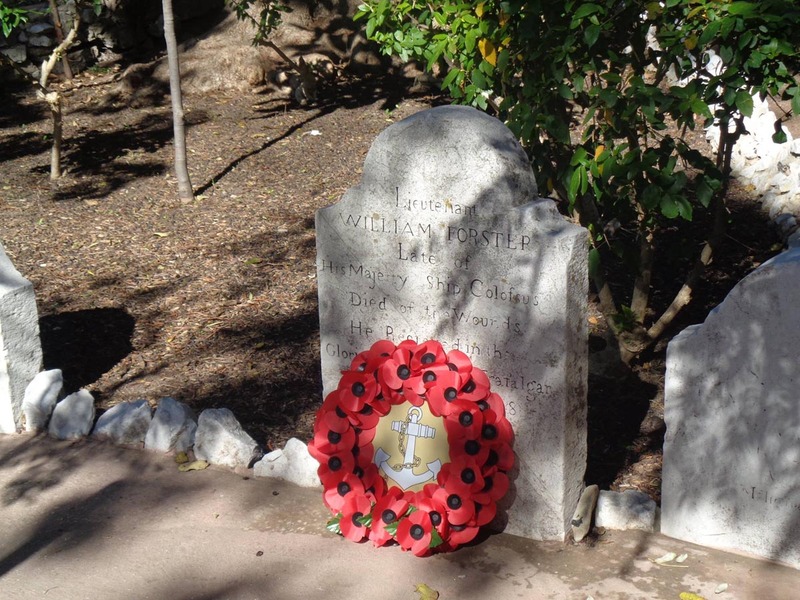 By the end of the engagement, Collingwood was one of only 3 of his officers left alive on his own quarterdeck. I think it is fair to say that he, they and the whole Fleet certainly did just that. He remains a national hero, worthy of our continued admiration, not least for his self-sacrifice and sense of duty, at a time when it appears to me that everyone knows their rights, but are sometimes more sketchy about the responsibilities that go with them. Look no further than Collingwood as a shining example. 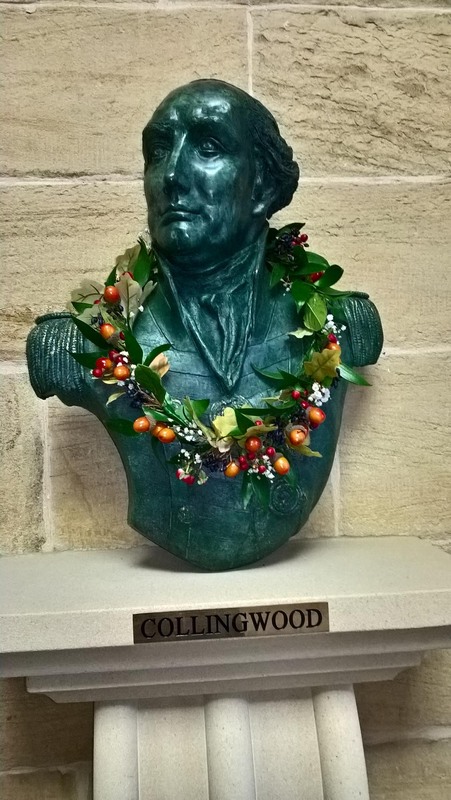 Therefore, may I ask you to turn and raise a glass to……..
Cuthbert Collingwood, Vice Admiral of the Red, 1st Baron Collingwood of Caldbourne and Hethpoole in Northumberland. 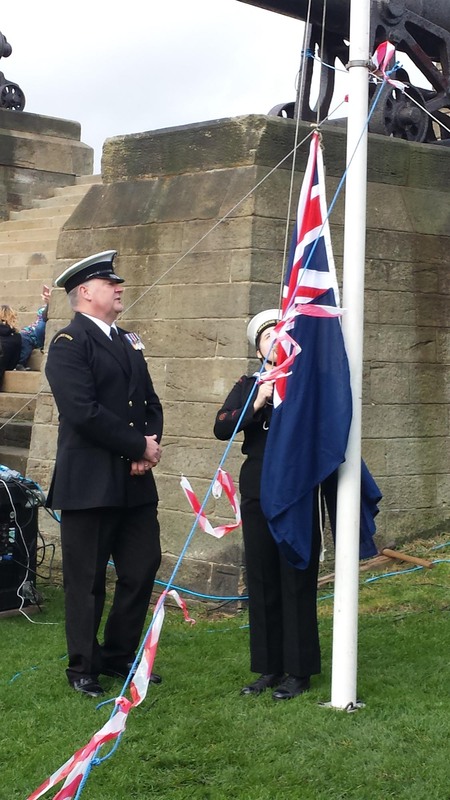 On the evening of 21st October 2017, the Tynemouth Volunteer Life Brigade, whose watch-house regularly plays a part in the Toast the Admiral event, re-ignited a former proud tradition of the organisation by using their signalling lamp to illuminate Admiral Lord Collingwood’s monument in recognition of this year’s ‘Trafalgar Day’. 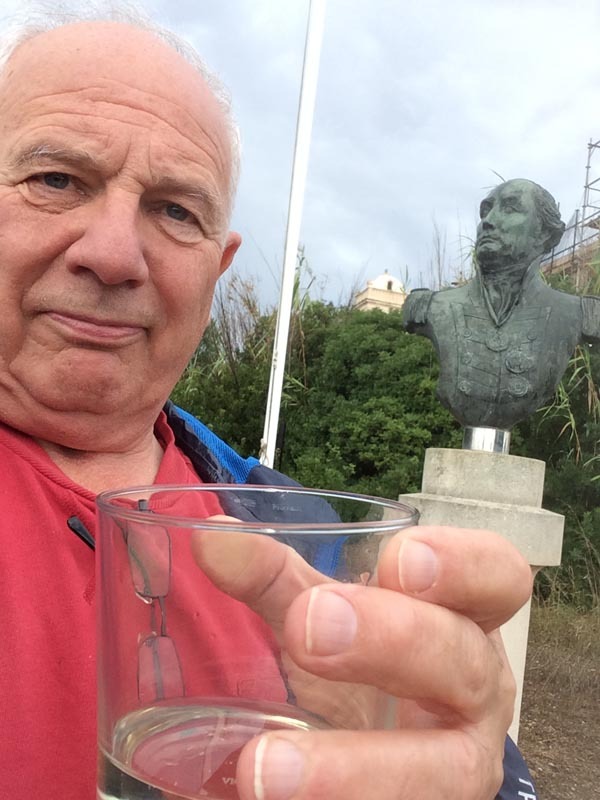 Brigade Secretary John Wright has spent many hours researching the history of how the Brigade has marked Trafalgar Day over the years and he recently discovered that as far back as 1905 the team used their signalling lamp, often referred to as a searchlight, to illuminate the statute. 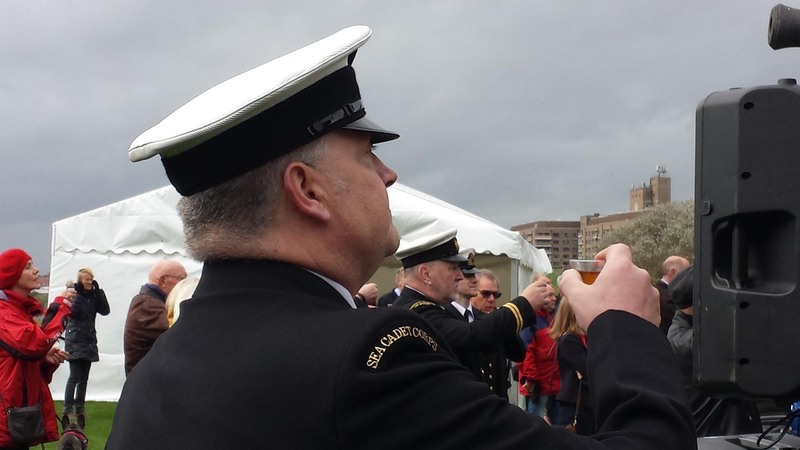 John, who is an Honorary Captain and Honorary Life Member of the Brigade, commented that ‘1905 marked the 100th anniversary of the Battle of Trafalgar and as such, the TVLB were keen to play a special role in these commemorations. 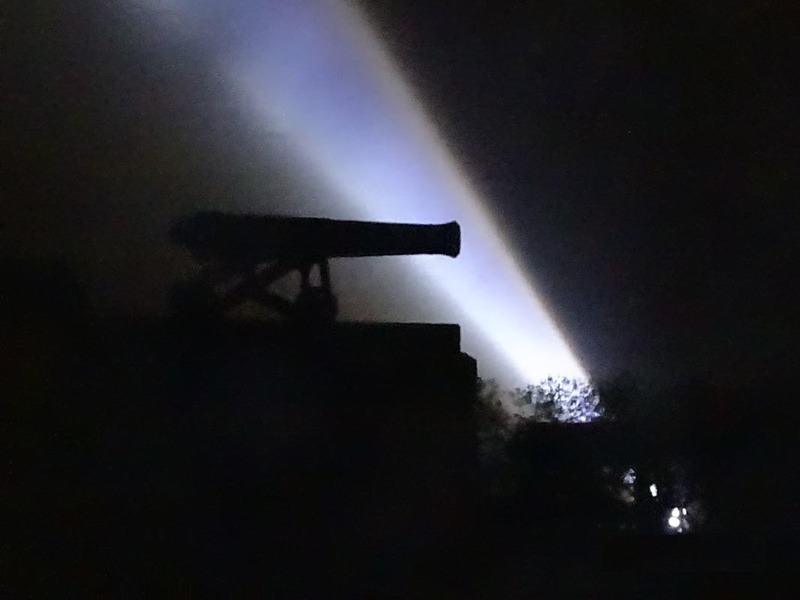 The minutes of the committee meetings from this time show that great pride was taken in marking the 21st October 1905 and ensuring the searchlight was in a fit and proper condition to use for over an hour’s illumination’. John’s research suggests that after a pause of 20 years, the annual illumination restarted in 1926 and carried on until 1936 when it was paused to allow for essential repairs to the signalling lamp. During World War Two the Brigade’s Watch House was commandeered by the Army and was not returned for use until 1947. Minutes of meetings from 1949 state that the tradition started again in this year, once a new lamp had been purchased by the TVLB due to bomb damage destroying the one in operation before the war. At some point during the late 1950s or early 1960s the illumination stopped, possibly around the time that a large annual bonfire organised on Collingwood’s Field was also brought to a close. 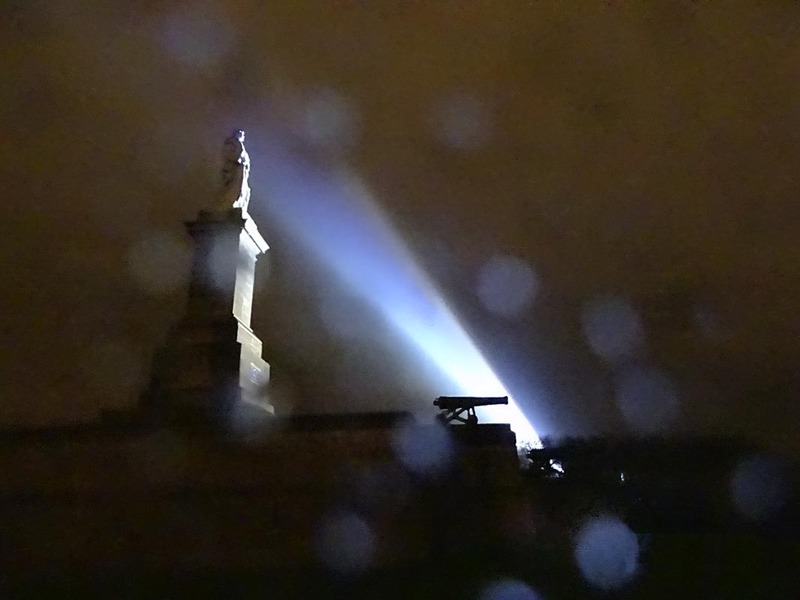 On Saturday 21st October 2017 John and a number of his colleagues lit up the monument, situated just to the West of the Watch House on Collingwood’s Field, between 7 and 7.30pm. 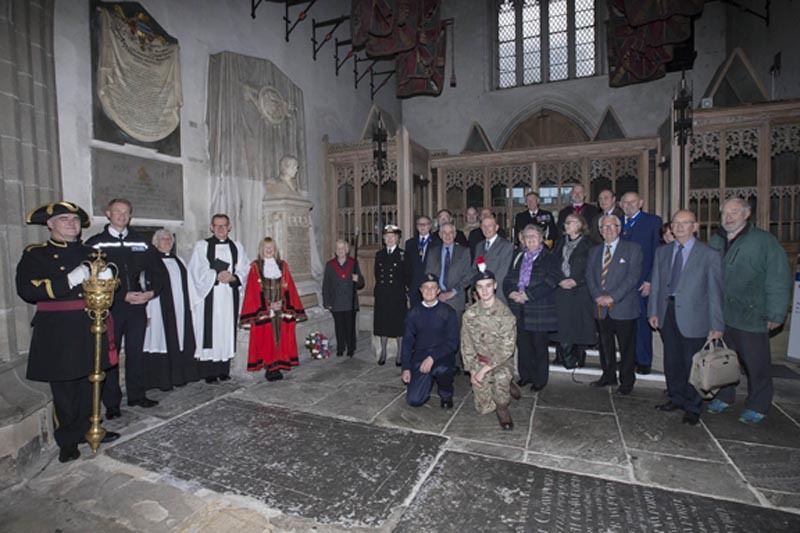 The Brigade was also represented at a number of other Trafalgar Day events in the region. 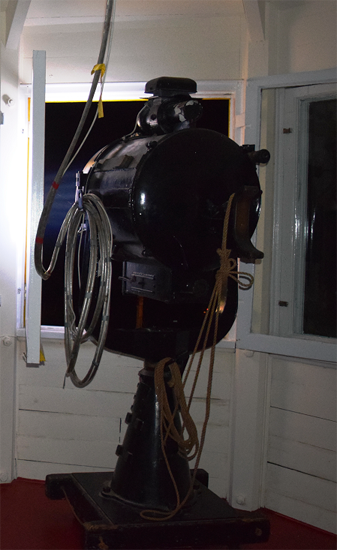 The lamp is a 20-inch signal projector whose primary function is for ship-to-ship communication, but can also be used as a searchlight. The lamp remains in operational use and the Rescue Team often rely on it when operating on the Black Middens or the North Tyne Pier. The Brigade has had a lamp or searchlight since 1903 following a collision between two steamers in the entrance to the River Tyne on 21st November 1902 which left eight men dead. 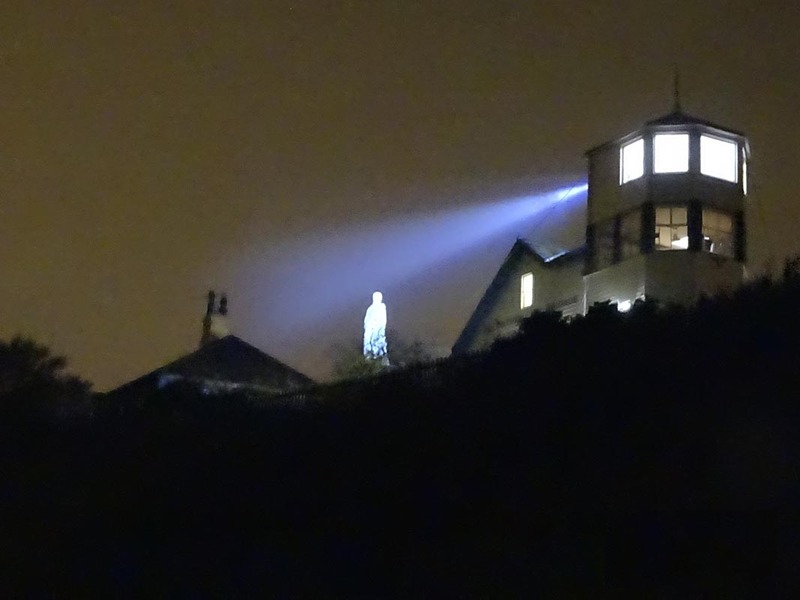 A local businessman, Roland Philipson, thought that the subsequent search for survivors might have been more successful had the area been illuminated, so he paid for a new searchlight to be installed in the Watch House, then for a new room with better elevation, with this room added onto the South Tower. The assistance of the TVLB Press Office is gratefully acknowledged. 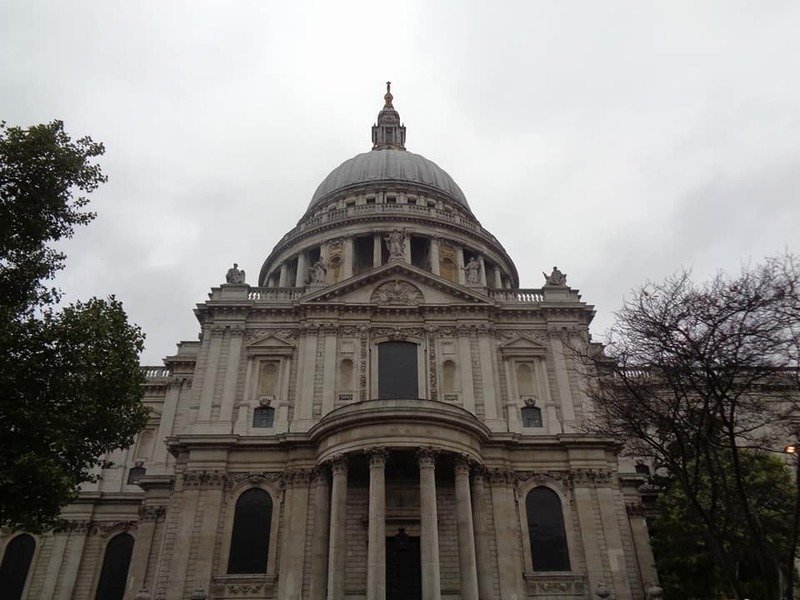 Images from ‘Flags’, having flown with all speed from St. Paul’s…. and last, but not least….. 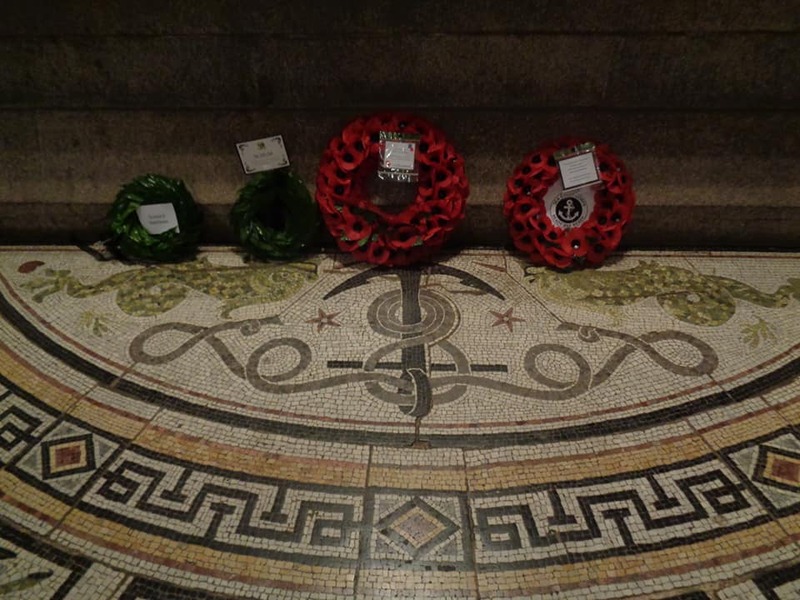 Images courtesy of Nigel Collingwood. A truly superb coverage by Society members. Any volunteers for next year in Collingwood, Ontario and Collingwood, New Zealand? (Relunctantly at own cost).